i didn't bring my running shoes to boston. which. is really nothing new. i've spent a lifetime as the victim of regrettably poor packing. but i didn't know we intended to stay in town so long. i didn't know that i had left my back up pair of shoes on the island and not in the city. i thought we'd be doing more moving and shaking and less craigslist surfing than we are. i also expected things to go More Smoothly. we didn't get the 48 acre farm for lease that we were planning on moving into. always counting my little chickens before they hatch. and so now we will be biding time with a room in somebody's basement near the farm we'll work at. until we re-figure things out. which. is really not what i want. but i'm Putting on a Good Face. and i'm eating a lot of candy. which brings me back to my lack of shoes. nick's mom's apartment building shares a basement with a running store. they have a box labeled 'donation shoes'. i had a thought that i could silently borrow a pair of these used sneaks, run in them for the week, and then slouch back down to the basement before we leave to return them. but its a morally grey area. so i think i'll just leave them be. but i do wish i'd run instead of consume candy corn. it doesn't help the nerves. it doesn't help the belly. it certainly doesn't help my petulant child breakdown in the early afternoon. feeling terrifically antsy. maybe i'll walk to cambridge tonight for a film screening. give my legs a little of what they're looking for. I'm sorry about...all of this. One blogger to another: If you want someone to vent to over a big cup of tea or cappuccino or, hell, vodka, I'm in Brighton. Sincerely. I know you must not have much time, but this must be a hard time for you. I hate transitions, and unsteady ones are that much more unwelcome. Sending happy thoughts to you, dear. 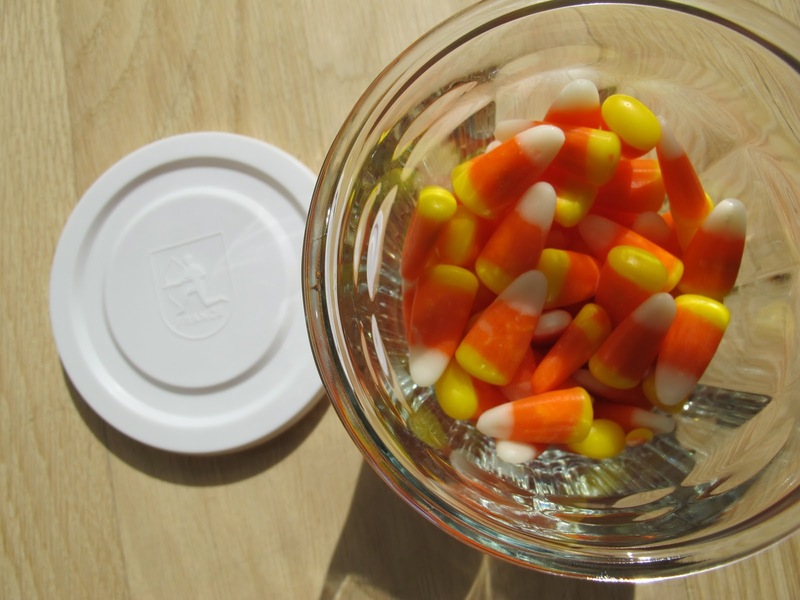 my sister and i may or may not have finished a jar of candy corn this morning... for an "after breakfast dessert"? sending (hopefully not creepy to you) hugs from california. You guys have had a rough few weeks and I'm sorry to hear it. Hang in there, girl. Your last few post have just broken my "need to be settled and things go smoothly" heart. It never stays, whatever it is, good or not nearly as good, there is always change. Change you don't really want when it is good, and change you can only pray for when where you are doesn't seem to fit.